"Mimi ni / I am"
What "Mimi ni/ I am" is an international continuation of Contracting An Issue (CAI). Mimi ni was formed while conducting fieldwork during a three-week-long residency at Warm Heart Art, in Tanzania. During my time, I worked alongside artist Seppo Hallavainio, a master papermaker, and the Zekana woman; a 10-year-old, HIV+, women's group that use arts for empowerment and income. Along with a group of support volunteers, and missionaries who were invaluable to the process which could not have happened without them. The Zekana woman, which is a group of Eleven woman, Ten bodies. Why The essential question for CAI is built around investigating how the stigma of HIV/AIDS does or does not affect people in diverse communities around the globe. Africa has the most serious and high-profile HIV and AIDS epidemic in the world. But I was less interested in Africa because of this high prevalence rate of HIV/AIDS than the difference in the social construct surrounding the disease. In America, the disease is tainted as an epidemic that affected mainly gays and bisexuals in the 1980s and 1990s. I understood that in present-day Africa women take the brunt of the blame; I wanted to better understand the complexity and the reach of the disease from a global perspective and working with the Zekana group allowed me an insight I did not yet have. My interaction was primarily with the women artists and the director/staff at the residency. My fieldwork was intended as stage one of three and was planned as an exploration of a global viewpoint around HIV/AIDS and the collaborative bridging of two worlds, Western and African. I spent much of my time, listening, talking and interacting concerning issues like HIV, displacement, queerness, employment, and empowerment. I was interested in giving the women a space to have a voice; what do they want to say? What are they interested in? Incorporating art forms such as wringing /storytelling, photography, video, and drawing. My secondary plan was to assist the women in networking, selling of their products, possibly on a global scale; currently, I hold a role for work, where I use arts as an economic and development tool with the University of Missouri. Goal/Overview Like most things in Africa, you must ask permission first from all higher parties involved, as part of the formality of doing work in Africa. So, before we could begin working with the women, we had to meet a pastor, his wife, the coordinator of the group, and the missionary that oversees the finances for the women. This process is very important, and once I had made our intentions clear, we were allowed to spend the morning meeting and planning with the group. We agreed the group would take transport to Seppo's workshop for four days over the next two weeks, meals, transport, and any other expenses would be covered by us. The name of the woman’s group is Zekana, meaning "is possible" in Swahili. The group was formed in 2008 and is a small group of 11 HIV+ women, (talk about how they are only ten women) that utilizes the arts to make income and have community therapy. 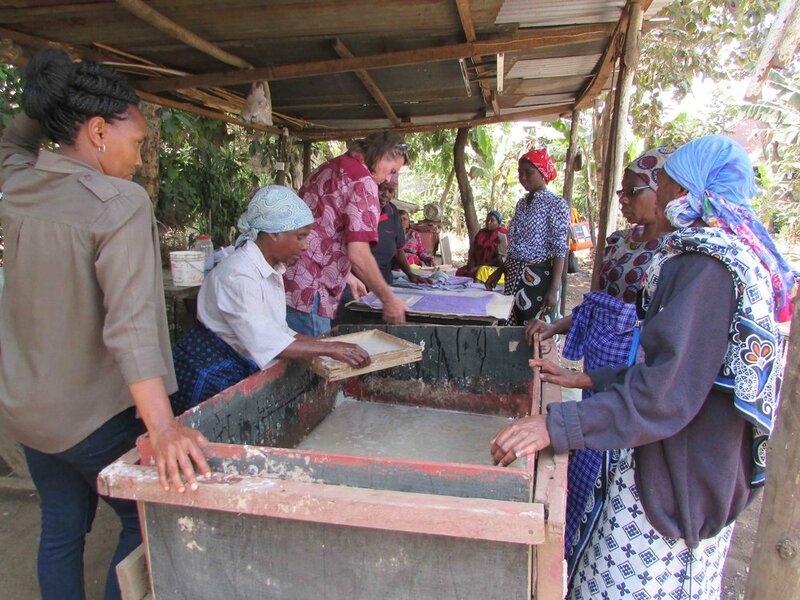 They focus mainly on producing recycled handmade paper products; creating unique greeting cards, paper, gift boxes, etc., while bonding, sharing issues, and enjoying a sisterhood of empowering each other. The sale of the products allows the group a “small” monthly income, to help them, and their families get by. Our days were full (9 am -3 pm); our time together centered around acts of exchange. Exchange of food, knowledge, getting to know each other and the awkward dance of translation because few people spoke the same language. Each time we met, we would do a creative exercise aimed at empowering the women; learning positive affirmations and providing a space for them to be creative and play. These activities included: drawing, writing, and paper/craft making. Each day our first and final interaction together, I would ask the women to think of a positive word(s) that represented them at that moment, out of this practice the name: “Mimi ni/ I am” was formed. This was one of the most difficult things for the women to accomplish because the concept of thinking of one’s self in this esoteric way is very western; when your day consists of surviving, it seems reflection is not a priority, it is also not a common part of the culture I saw of Africa. During our time, together I also tried to create a space and time just to listen, conduct interviews, and hear from the women in their words; what was going on in their lives, the struggles they faced around being HIV+ in Tanzania. It seemed during our short time together with the women, the most important thing to them was the simple gesture of providing and sharing food/dishes. The woman had been seen and treated like trash, discarded, so just eating and using the same plates was a gift. 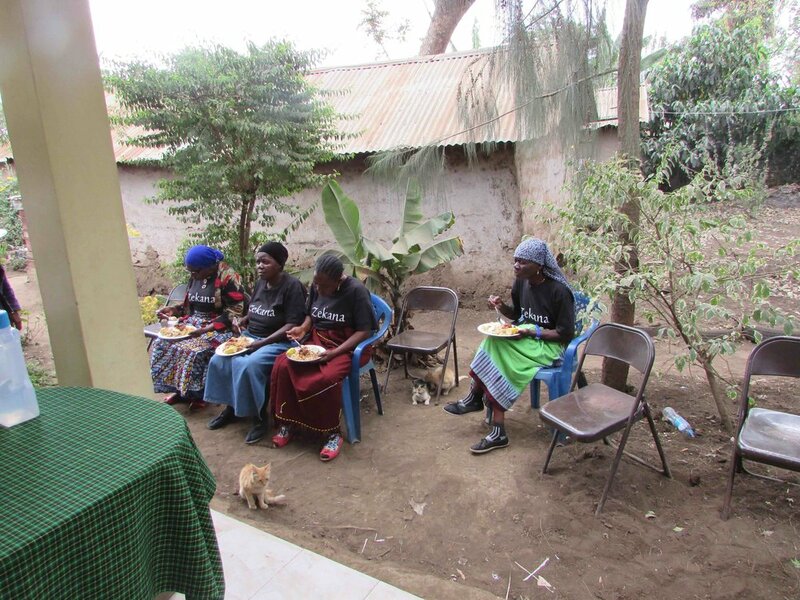 Each lady talked about how once people knew they were positive that people would not share dishes, the toilet, or things like salt with them (sharing salt is like sharing a cup of sugar with your neighbor in the United States) and how they are treated like a leopard. It seems there is a lack of knowledge of how HIV is spread in Arusha. One lady informed me that at the end of our time together, that on the first day I visited their workshop and told them my plans, they were all sure I would call and cancel because very rarely did anyone ever invests or see them as worth anything. As one last gesture for the woman, I hired the host of the residency (Sarah Mollel) to make the women a cake, with "Zekana" and “Mimi ni/ I am” on it. On the last day, after our lunch we set around an eat cake together, helping seal in our new friendship. “Mimi ni” was a powerful experience for me, and out of this fieldwork, we collectively decided to develop collaborative works/art posters together, along with Seppo and the Danish couple (who oversee the group). We plan to call upon the works made by art groups like Act Up and Boy/Girl Akimbo; we will work collaboratively and educate the women on the past works and have them aid in the recreation of new posters in Swahili, which fit their culture. I also plan to return to Arusha next year and work with the women to create collaborative performances that speak to the struggles they face around HIV/AIDS. Below are images of some of the other work we made collectively, some are finished project and most are studies or documtaion of our time together. For me, producing ART is about more than just making stuff . In a world where we have too much stuff, the desire to contribute has become the driving force that pushes my creativity.